Capitalism - Welcome to Our Generation USA! is an economic system based on private ownership of the means of production and their operation for-profit. In a capitalist market economy, decision-making and investment are determined by the owners of the means of production in financial and capital markets, whereas prices and the distribution of goods and services are mainly determined by competition in goods and services markets. An economic system based on private ownership of the means of production and their operation for profit. In a capitalist market economy, decision-making and investment is determined by the owners of the factors of production in financial and capital markets, and prices and the distribution of goods are mainly determined by competition in the market. Different forms of capitalism feature varying degrees of free markets, public ownership, obstacles to free competition, and state-sanctioned social policies. The degree of competition in markets, the role of intervention and regulation, and the scope of state ownership vary across different models of capitalism; the extent to which different markets are free, as well as the rules defining private property, are matters of politics and of policy. Most existing capitalist economies are mixed economies, which combine elements of free markets with state intervention, and in some cases, with economic planning. It is also known as a capitalist democracy, is a political, economic and social ideology that involves the combination of a democratic political system with a capitalist economic system. It is based on a tripartite arrangement of a private sector-driven market economy based predominantly on a democratic policy, economic incentives through free markets, fiscal responsibility and a liberal moral-cultural system which encourages pluralism. This ideology supports a capitalist economy subject to control by a democratic political system that is supported by the majority. It stands in contrast to authoritarian capitalism by limiting the influence of special interest groups, including corporate lobbyists, on politics. It is argued that the coexistence of modern capitalism and democracy was the result of the creation of the modern welfare state in the post-war period, which enabled a relatively stable political atmosphere and widespread support for capitalism. This period of history is often referred to as the "Golden Age of Capitalism". Free trade is a policy followed by some international markets in which countries' governments do not restrict imports from, or exports to, other countries. Free trade is exemplified by the European Economic Area and the North American Free Trade Agreement, which have established open markets. Most nations are today members of the World Trade Organization (WTO) multilateral trade agreements. However, most governments still impose some protectionist policies that are intended to support local employment, such as applying tariffs to imports or subsidies to exports. Governments may also restrict free trade to limit exports of natural resources. Other barriers that may hinder trade include import quotas, taxes, and non-tariff barriers, such as regulatory legislation. Click here for further amplification about Free Trade. Fair trade is a social movement whose stated goal is to help producers in developing countries achieve better trading conditions and to promote sustainability. Members of the movement advocate the payment of higher prices to exporters, as well as improved social and environmental standards. The movement focuses in particular on commodities, or products which are typically exported from developing countries to developed countries, but also consumed in domestic markets (e.g. Brazil, India and Bangladesh) most notably handicrafts, coffee, cocoa, wine, fresh fruit, chocolate, flowers and gold. The movement seeks to promote greater equity in international trading partnerships through dialogue, transparency, and respect. It promotes sustainable development by offering better trading conditions to, and securing the rights of, marginalized producers and workers in developing countries. Fair trade is grounded in three core beliefs; first, producers have the power to express unity with consumers. Secondly, the world trade practices that currently exist promote the unequal distribution of wealth between nations. Lastly, buying products from producers in developing countries at a fair price is a more efficient way of promoting sustainable development than traditional charity and aid. and European Fair Trade Association (EFTA). Specifically, fair trade is a trading partnership, based on dialogue, transparency, and respect, that seeks greater equity in international trade. Fair trade organizations, backed by consumers, are engaged actively in supporting producers, awareness raising, and in campaigning for changes in the rules and practice of conventional international trade. There are several recognized fair trade certifiers, including Fairtrade International (formerly called FLO, Fairtrade Labelling Organizations International), IMO, Make Trade Fair and Eco-Social. Additionally, Fair Trade USA, formerly a licensing agency for the Fairtrade International label, broke from the system and is implementing its own fair trade labelling scheme, which has resulted in controversy due to its inclusion of independent smallholders and estates for all crops. In 2008, Fairtrade International certified approximately (€3.4B) of products. The World Trade Organization publishes annual figures on the world trade of goods and services. In 2011, over 1.2 million farmers and workers in more than 60 countries participated in Fairtrade International's fair trade system, which included €65 million in fairtrade premium paid to producers for use developing their communities. According to Fairtrade International, nearly six out of ten consumers have seen the Fairtrade mark and almost nine in ten of them trust it. Some criticisms have been raised about fair trade systems. One 2015 study in a journal published by the MIT Press concluded that producer benefits were close to zero because there was an oversupply of certification, and only a fraction of produce classified as fair trade was actually sold on fair trade markets, just enough to recoup the costs of certification. 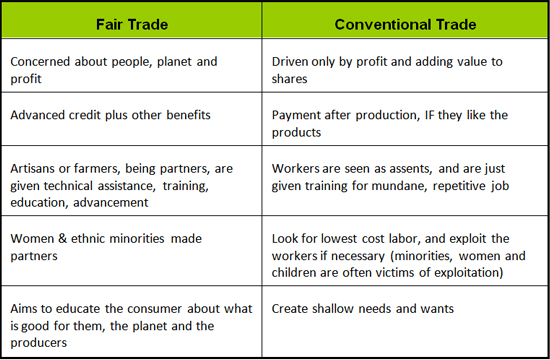 Some research indicates that the implementation of certain fair trade standards can cause greater inequalities in some markets where these rigid rules are inappropriate for the specific market. In the Fair trade debate there are complaints of failure to enforce the fair trade standards, with producers, cooperatives, importers and packers profiting by evading them. Click here for further amplification about Fair Trade. The agreement came into force on January 1, 1994. It superseded the Canada–United States Free Trade Agreement between the U.S. and Canada. Following diplomatic negotiations dating back to 1990 among the three nations, U.S. President George H. W. Bush, Canadian Prime Minister Brian Mulroney and Mexican President Carlos Salinas, each responsible for spearheading and promoting the agreement, ceremonially signed the agreement in their respective capitals on December 17, 1992.The signed agreement then needed to be ratified by each nation's legislative or parliamentary branch. In the U.S., Bush, who had worked to "fast track" the signing prior to the end of his term, ran out of time and had to pass the required ratification and signing of the implementation law to incoming president Bill Clinton. Prior to sending it to the United States Senate Clinton added two side agreements, The North American Agreement on Labor Cooperation (NAALC) and the North American Agreement on Environmental Cooperation (NAAEC), to protect workers and the environment, plus allay the concerns of many House members. After much consideration and emotional discussion, the House of Representatives passed the North American Free Trade Agreement Implementation Act on November 17, 1993, 234-200. The agreement's supporters included 132 Republicans and 102 Democrats. The bill passed the Senate on November 20, 1993, 61-38. Senate supporters were 34 Republicans and 27 Democrats. Clinton signed it into law on December 8, 1993; the agreement went into effect on January 1, 1994. Clinton, while signing the NAFTA bill, stated that "NAFTA means jobs. American jobs, and good-paying American jobs. If I didn't believe that, I wouldn't support this agreement." The goal of NAFTA was to eliminate barriers to trade and investment between the U.S., Canada and Mexico. The implementation of NAFTA on January 1, 1994 brought the immediate elimination of tariffs on more than one-half of Mexico's exports to the U.S. and more than one-third of U.S. exports to Mexico. Within 10 years of the implementation of the agreement, all U.S.-Mexico tariffs would be eliminated except for some U.S. agricultural exports to Mexico that were to be phased out within 15 years. Most U.S.-Canada trade was already duty-free. NAFTA also sought to eliminate non-tariff trade barriers and to protect the intellectual property rights on traded products. Chapter 52 provides a procedure for the international resolution of disputes over the application and interpretation of NAFTA. It was modelled after Chapter 69 of the Canada-United States Free Trade Agreement. Securing U.S. congressional approval for NAFTA would have been impossible without addressing public concerns about NAFTA’s environmental impact. The Clinton administration negotiated a side agreement on the environment with Canada and Mexico, the North American Agreement on Environmental Cooperation (NAAEC), which led to the creation of the Commission for Environmental Cooperation (CEC) in 1994. To alleviate concerns that NAFTA, the first regional trade agreement between a developing country and two developed countries, would have negative environmental impacts, the CEC was given a mandate to conduct ongoing ex post environmental assessment of NAFTA. In response to this mandate, the CEC created a framework for conducting environmental analysis of NAFTA, one of the first ex post frameworks for the environmental assessment of trade liberalization. The framework was designed to produce a focused and systematic body of evidence with respect to the initial hypotheses about NAFTA and the environment, such as the concern that NAFTA would create a "race to the bottom" in environmental regulation among the three countries, or the hope that NAFTA would pressure governments to increase their environmental protection mechanisms. The CEC has held four symposia using this framework to evaluate the environmental impacts of NAFTA and has commissioned 47 papers on this subject. In keeping with the CEC’s overall strategy of transparency and public involvement, the CEC commissioned these papers from leading independent experts. From the earliest negotiation, agriculture was (and still remains) a controversial topic within NAFTA, as it has been with almost all free trade agreements that have been signed within the WTO framework. Agriculture is the only section that was not negotiated trilaterally; instead, three separate agreements were signed between each pair of parties. The Canada–U.S. agreement contains significant restrictions and tariff quotas on agricultural products (mainly sugar, dairy, and poultry products), whereas the Mexico–U.S. pact allows for a wider liberalization within a framework of phase-out periods (it was the first North–South FTA on agriculture to be signed). In a study published in the August 2008 issue of the American Journal of Agricultural Economics, NAFTA has increased U.S. agricultural exports to Mexico and Canada even though most of this increase occurred a decade after its ratification. The study focused on the effects that gradual "phase-in" periods in regional trade agreements, including NAFTA, have on trade flows. Most of the increase in members’ agricultural trade, which was only recently brought under the purview of the World Trade Organization, was due to very high trade barriers before NAFTA or other regional trade agreements. The U.S. foreign direct investment (FDI) in NAFTA countries (stock) was $327.5 billion in 2009 (latest data available), up 8.8% from 2008. The U.S. direct investment in NAFTA countries is in non-bank holding companies, and in the manufacturing, finance/insurance, and mining sectors. The foreign direct investment of Canada and Mexico in the United States (stock) was $237.2 billion in 2009 (the latest data available), up 16.5% from 2008. ​According to the Sierra Club, NAFTA contributed to large-scale, export-oriented farming, which led to the increased use of fossil fuels, pesticides and GMO. NAFTA also contributed to environmentally destructive mining practices in Mexico. It prevented Canada from effectively regulating its tar sands industry, and created new legal avenues for transnational corporations to fight environmental legislation. In some cases, environmental policy was neglected in the wake of trade liberalization; in other cases, NAFTA's measures for investment protection, such as Chapter 11, and measures against non-tariff trade barriers threatened to discourage more vigorous environmental policy. ​The most serious overall increases in pollution due to NAFTA were found in the base metals sector, the Mexican petroleum sector, and the transportation equipment sector in the United States and Mexico, but not in Canada. According to the Department of Homeland Security Yearbook of Immigration Statistics, during fiscal year 2006 (i.e., October 2005 through September 2006), 73,880 foreign professionals (64,633 Canadians and 9,247 Mexicans) were admitted into the United States for temporary employment under NAFTA (i.e., in the TN status). Additionally, 17,321 of their family members (13,136 Canadians, 2,904 Mexicans, as well as a number of third-country nationals married to Canadians and Mexicans) entered the U.S. in the treaty national's dependent (TD) status. Because DHS counts the number of the new I-94 arrival records filled at the border, and the TN-1 admission is valid for three years, the number of non-immigrants in TN status present in the U.S. at the end of the fiscal year is approximately equal to the number of admissions during the year. (A discrepancy may be caused by some TN entrants leaving the country or changing status before their three-year admission period has expired, while other immigrants admitted earlier may change their status to TN or TD, or extend TN status granted earlier). Acording to the International Organization for Migration, deaths of migrants have been on the rise worldwide with 5,604 deaths in 2016. Canadian authorities estimated that, as of December 1, 2006, a total of 24,830 U.S. citizens and 15,219 Mexican citizens were present in Canada as "foreign workers". These numbers include both entrants under the NAFTA agreement and those who have entered under other provisions of the Canadian immigration law. ​Jeffrey Preston Bezos (né Jorgensen; born January 12, 1964) is an American technology and retail entrepreneur, investor, electrical engineer, computer scientist, and philanthropist, best known as the founder, chairman, and chief executive officer of Amazon.com, the world's largest online shopping retailer. Warren Edward Buffett (born August 30, 1930) is an American business magnate, investor, and philanthropist who serves as the chairman and CEO of Berkshire Hathaway. He is considered one of the most successful investors in the world and has a net worth of $87.5 billion as of February 17, 2018, making him the third wealthiest person in the United States and in the world. Buffett attended New York Institute of Finance to focus his economics background and soon after began various business partnerships, including one with Graham. He created the Buffett Partnership after meeting Charlie Munger, and his firm eventually acquired a textile manufacturing firm called Berkshire Hathaway and assumed its name to create a diversified holding company. 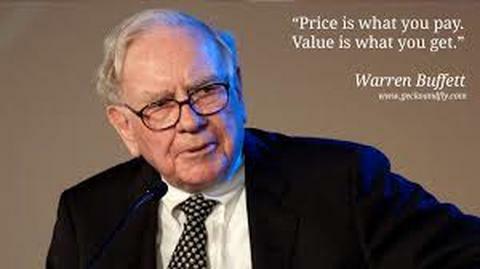 Buffett has been the chairman and largest shareholder of Berkshire Hathaway since 1970, and he has been referred to as the "Wizard", "Oracle", or "Sage" of Omaha by global media outlets. He is noted for his adherence to value investing and for his personal frugality despite his immense wealth. Buffett is a notable philanthropist, having pledged to give away 99 percent of his fortune to philanthropic causes, primarily via the Bill & Melinda Gates Foundation. He founded The Giving Pledge in 2009 with Bill Gates and Mark Zuckerberg, whereby billionaires pledge to give away at least half of their fortunes. Buffett is also active contributing to political causes, having endorsed Democratic candidate Hillary Clinton in the 2016 U.S. presidential election; he has publicly opposed the policies, actions, and statements of the current U.S. president, Donald Trump. "Warren Buffett's Letters to Shareholders". Berkshire Hathaway. "Warren Buffett collected news and commentary". The New York Times. "Warren Buffett collected news and commentary". The Guardian. YouTube Video by George Soros: "We Are Repeating 2008"
George Soros, Hon FBA (born György Schwartz; August 12, 1930) is a Hungarian-American investor and philanthropist. As of February 2018, he had a net worth of $8 billion, after donating $18 billion to his philanthropic agency, Open Society Foundations. Born in Budapest, Soros survived Nazi Germany-occupied Hungary and immigrated to England in 1947 after Hungary was occupied by Soviet troops. He attended the London School of Economics, graduating with a bachelor's and eventually a master's degree in philosophy. Soros began his business career by taking various jobs at merchant banks in England and then the United States, before starting his first hedge fund, Double Eagle, in 1969. 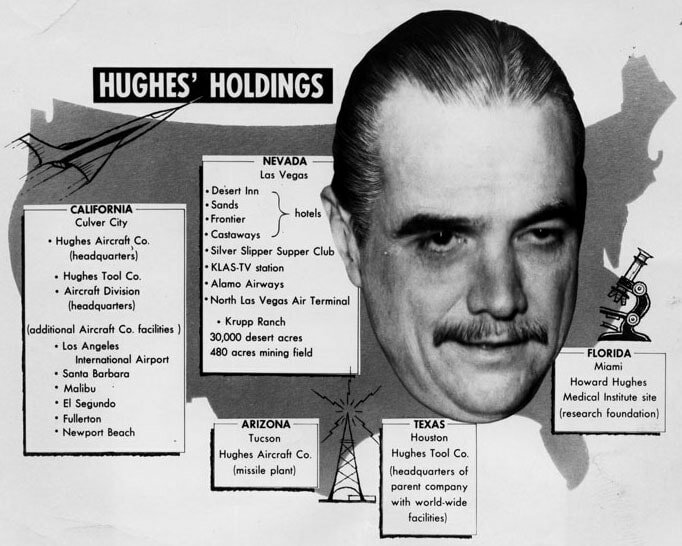 Profits from his first fund furnished the seed money to start Soros Fund Management, his second hedge fund, in 1970. Double Eagle was renamed to Quantum Fund and was the principal firm Soros advised. At its founding, Quantum Fund had $12 million in assets under management, and as of 2011 it had $25 billion, the majority of Soros's overall net worth. Soros is known as "The Man Who Broke the Bank of England" because of his short sale of US$10 billion worth of pounds sterling, which made him a profit of $1 billion during the 1992 Black Wednesday UK currency crisis. Based on his early studies of philosophy, Soros formulated an application of Karl Popper's General Theory of Reflexivity to capital markets, which he claims renders him a clear picture of asset bubbles and fundamental/market value of securities, as well as value discrepancies used for shorting and swapping stocks. Soros is a well-known supporter of progressive and liberal political causes, to which he dispenses donations through his foundation, the Open Society Foundations. Between 1979 and 2011, he donated more than $11 billion to various philanthropic causes; by 2017, his donations "on civil initiatives to reduce poverty and increase transparency, and on scholarships and universities around the world" totaled $12 billion. Soros influenced the collapse of communism in Eastern Europe in the late 1980s and early 1990s, and provided one of Europe's largest higher education endowments to the Central European University in his Hungarian hometown. His extensive funding of political causes has made him a "bugaboo of European nationalists". 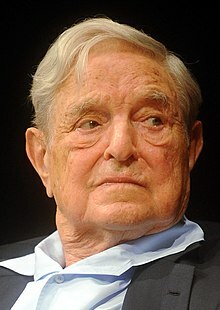 Numerous American conservatives have promoted false claims that characterize Soros as a singularly dangerous "puppetmaster" behind a variety of alleged global plots, with The New York Times reporting that by 2018 these claims had "moved from the fringes to the mainstream" of Republican politics. Click here for more about George Soros. YouTube Video: What is The Keynesian Theory? Keynesian economics are the various macroeconomic theories about how in the short run – and especially during recessions – economic output is strongly influenced by aggregate demand (total demand in the economy). In the Keynesian view, aggregate demand does not necessarily equal the productive capacity of the economy; instead, it is influenced by a host of factors and sometimes behaves erratically, affecting production, employment, and inflation. Keynesian economics developed during and after the Great Depression, from the ideas presented by John Maynard Keynes in his 1936 book, The General Theory of Employment, Interest and Money. Keynes contrasted his approach to the aggregate supply-focused classical economics that preceded his book. The interpretations of Keynes that followed are contentious and several schools of economic thought claim his legacy. Keynesian economists generally argue that, as aggregate demand is volatile and unstable, a market economy will often experience inefficient macroeconomic outcomes in the form of economic recessions (when demand is low) and inflation (when demand is high). These can be mitigated by economic policy responses, in particular, monetary policy actions by the central bank and fiscal policy actions by the government, which can help stabilize output over the business cycle. Keynesian economists generally advocate a managed market economy – predominantly private sector, but with an active role for government intervention during recessions and depressions. Keynesian economics served as the standard economic model in the developed nations during the later part of the Great Depression, World War II, and the post-war economic expansion (1945–1973), though it lost some influence following the oil shock and resulting stagflation of the 1970s. The advent of the financial crisis of 2007–08 caused a resurgence in Keynesian thought, which continues as new Keynesian economics. Laissez-faire is an economic system in which transactions between private parties are free from government intervention such as regulation, privileges, tariffs and subsidies. The phrase laissez-faire is part of a larger French phrase and translates to "let (it/them) do", but in this context usually means "let go". YouTube Video of the 1987 Movie "Wall Street": "Greed is Good"
Criticism of capitalism ranges from expressing disagreement with the principles of capitalism in its entirety to expressing disagreement with particular outcomes of capitalism. Criticism of capitalism comes from various political and philosophical approaches, including anarchist, socialist, religious and nationalist viewpoints. Some believe that capitalism can only be overcome through revolution, and some believe that structural change can come slowly through political reforms. Some critics believe there are merits in capitalism and wish to balance it with some form of social control, typically through government regulation (e.g. the social market movement). Prominent among critiques of capitalism are accusations that capitalism is inherently exploitative, that it is unsustainable, that it creates economic inequality, that it is anti-democratic and leads to an erosion of human rights and that it incentivizes imperialist expansion and war. Crisis of Capitalism by David Harvey. Royal Society of Arts. 28 June 2010. Richard Wolff on Curing Capitalism. Moyers & Company. 22 March 2013. 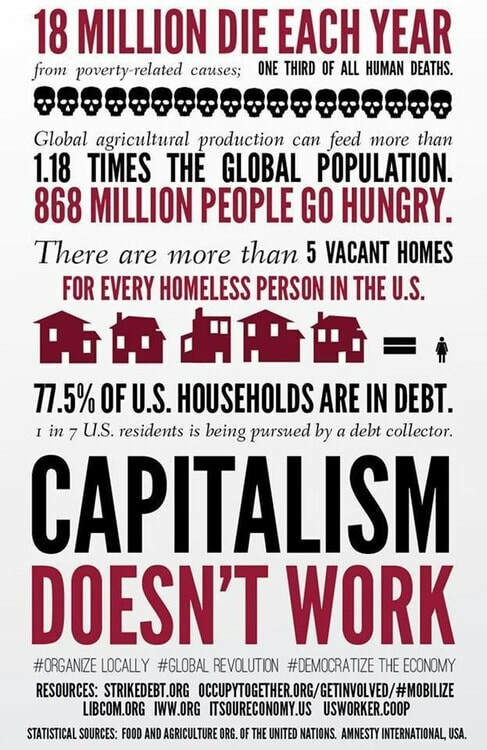 Occupy was right: capitalism has failed the world. Andrew Hussey. The Guardian. 12 April 2014 (interview with Thomas Piketty). New Zealand's new prime minister calls capitalism a 'blatant failure'. The Independent. 22 October 2017.